In this first title, A Bushveld Safari, Jabu the Shangaan guide takes the reader on a trail through the lowveld, or more specifically, through the Kruger National park. 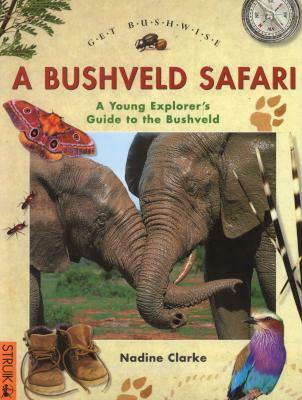 Chapters are organised to illuminate a range of topics, such as 'Bushveld supermarket' (items from nature that have practical applications), 'Feeding levels' (showing how and where different animals feed - from roots and grass through to the tree tops), 'Self defence' (how animals defend themselves), and 'The night shift' (focusing on the habits of nocturnal animals). In each scenario, Jabu discusses the balance and efficiency of nature, points out its extraordinary features , and explains how people have, in the past, lived in harmony with nature - and why it's important for us to continue to do so. Nadine Clarke is an established non-fiction wildlife author for children of South Africa. Her bind up book called On Safari is not only a bestseller but is the endorsed programme for the Junior Field Guides Association of South Africa. Nadine then went on to produce a 39 part television series called Get Bushwise based on the On Safari content. She currently resides in the Western Cape and is publishing new work for her audience.